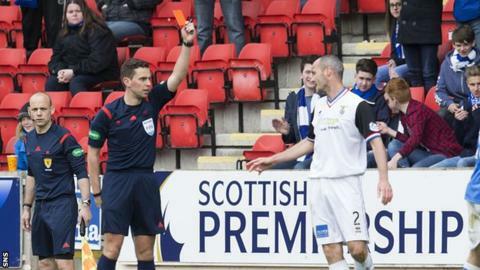 Inverness manager John Hughes said referee Andrew Dallas was "out of his depth" after the Scottish Cup finalists drew 1-1 with St Johnstone. Aaron Doran's opener was cancelled out by Brian Graham's late goal, in a game where David Raven was sent off for a second booking. The result keeps Inverness four points clear in third place as they battle for a Europa League spot. "We're playing in the SPL and I expect better performances from the referee than that," Hughes told BBC Scotland. "He looked a little out of his depth, flashing yellow cards all over the place, and he had a word with me and I was telling him to calm down because I've been in the game a long time - I knew a red card was coming, and unfortunately it went against us. "You need to be cool, calm, collected. I expect better than that. "He was getting conned, people were falling down. And for me there was probably one yellow card in the whole game. Apart from that it was handbag stuff all over the place." Hughes was also annoyed with St Johnstone's late goal that denied his side the three points. "I'm just a little bit disappointed to concede the goal in the last 10 minutes," he said. "I thought we might have seen the game out, kept a clean sheet. We made the substitutions to do that." St Johnstone manager Tommy Wright felt his side merited the point, and also praised his side for improving on last season. He said: "I thought we were the better team and deserved at least a draw, so I'm really pleased to get back in the game. The performance was excellent and on another day we could have got three points against a very good team. "With Dundee United winning and Inverness getting a point today and keeping that four point gap, a lot will depend on Tuesday night [Inverness v Dundee United] and what happens in that game. With three games left, if our performances are as good as that we'll pick up points. "It's great we can talk about St Johnstone missing out on something and that's how far we've come, but overall this has been another great season for us. "We're one point off where we were last year at this stage. We only finished sixth last season but we can possibly finish third and have a good chance of fourth. "I think fifth is nearly guaranteed almost so that is an improvement and we've done that on the back of losing one of our best players, so I think it's been another successful season for the club."